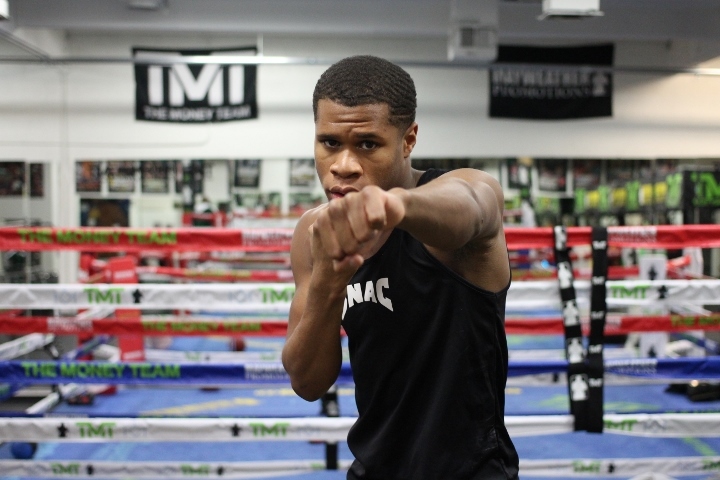 One of the things Stephen Espinoza especially likes about Devin Haney is his willingness to accept steps up in competition every fight. The precocious prospect/contender just turned 20 in mid-November. That hasn’t stopped the talented lightweight from embracing the types of challenges television executives like Espinoza expect when paying sizeable license fees for content. Espinoza, Showtime’s president for sports and event programming, thinks Haney is on the cusp of becoming a “Showtime Championship Boxing” fighter. First, though, the Las Vegas resident must pass what Haney anticipates will be the most difficult fight of his three-year pro career Friday night. Haney (20-0, 13 KOs) is scheduled to box unbeaten South African contender Xolisani Ndongeni in a 10-round lightweight bout that’ll headline a “ShoBox: The New Generation” tripleheader from Shreveport, Louisiana (10 p.m. ET/7 p.m. PT). Ndongeni has competed outside of South Africa just once in his eight-year pro career, but the 28-year-old contender is skilled and hungry, well aware of how upsetting Haney could change his entire life. Espinoza is interested in watching how Haney deals with a legitimate lightweight contender who’s in his physical prime. “Through his ‘ShoBox’ appearances, Devin has already demonstrated that he sort of deserves to be considered as one of the top young, rising stars in the sport,” Espinoza said. “And now begins the process of stepping up, and seeing how deep his talent really is. In the conversations with Devin and his father, they haven’t been reluctant at all to take tougher fights. So, I think this is the first step of many in which these opponents are gonna be successively more challenging, and we’ll find out how good Devin really is. Victories over Mason Menard and Juan Carlos Burgos in his past two fights have advanced Haney’s career. Unlike Ndongeni, though, each of those opponents had lost before Haney defeated them. Haney beat Menard (34-4, 24 KOs) by technical knockout following nine one-sided rounds May 11 at 2300 Arena in Philadelphia. Four months later, Haney expertly out-boxed Burgos (33-3-2, 21 KOs) in their 10-rounder September 28 at Pechanga Resort & Casino in Temecula, California. Prior to losing to Haney, Burgos hadn’t been beaten since four-division champion Mikey Garcia (39-0, 30 KOs) topped him by unanimous decision in their January 2014 bout in The Theater at Madison Square Garden in New York. Burgos’ comparative inactivity between his fights against Garcia and Haney cost him, however. He also experienced most of his success within the featherweight division, two weight classes below where he lost to Haney. Haney didn’t attain his goal of becoming the first fighter to knock out the Mexican veteran, though he did beat Burgos convincingly. Haney won all 10 rounds on two scorecards (100-90) and one judge scored seven of their 10 rounds for him (97-93). Before Haney and Ndongeni square off, Showtime will televise two undercard fights from Stage Works, a studio complex in downtown Shreveport. The three-fight telecast will start with heavyweights – an eight-rounder that’ll match Cuba’s Frank Faure (10-0, 8 KOs, 1 NC) against Indianapolis’ Willie Jake Jr. (8-1-1, 2 KOs). The co-featured fight, an eight-round battle between featherweight prospects, will pit Ruben Villa (14-0, 5 KOs), a southpaw from Salinas, California, against Colombia’s Ruben Cervera (10-0, 9 KOs, 1 NC).